WILLEMSTAD – There are several political leaders who are expressing their opinion about the political future of the island. In a recent statement to the media, the leader of the opposition party Korsou di Nos Tur (Curaçao for us all) and Member of Parliament, Amparo dos Santos indicated that Curaçao must do exactly what Sint Eustatius is doing right now which is to rebel against the Netherlands. 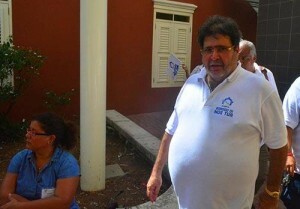 He even went further saying that Curaçao must become independent. “We have everything. We produce enough for ourselves. What is wrong with us? We have to become independent,” said Dos Santos in his statement.